Firefox’s new ad blocking and tracking script-blocking feature is quite useful. As it strips out all popups and advertisements, the web pages load quite faster than before. Not only that, as it block tracking script (analytic code, Facebook Like button, etc.) website owners will not track your browsing activity. This new ad blocking and tracking script-blocking feature is not limited to any particular platform. It is available on all the platforms where Firefox is currently available including Windows, Android, Linux and Mac. Also, along with this built-in ad-blocking feature, Firefox has also introduced a new Control Center, which covers all the site security and privacy related controls in a single place in your address bar. 1. Go to Options -> Privacy -> and check the box next to ‘Always use private browsing mode’. 2. 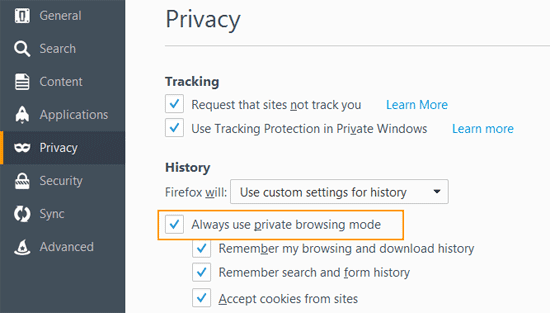 Now, whenever you open Firefox browser, it will open in private browsing mode. Other users who do not want to always open Firefox in private browsing mode, simple press Control + Shift + P key or go to menu (three bar) and click ‘New private window’.You can download latest version of Firefox browser from here.